This probably sounds really strange, but I love cleaning my make up brushes. There is just something about it that I find really therapeutic and relaxing. I like to clean my make up brushes at least once a fortnight. From touching your face, to sitting in a pot or on your dressing table, they obviously get built up with make up and germs. 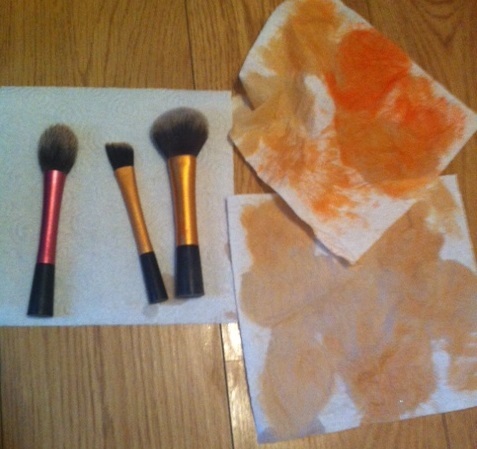 If you have invested in good make up brushes, you might as well as clean them so they last even longer. This No 7 Make Up Brush Cleaner is absolutely PERFECT. Nothing could be easier. You simply squirt some of the cleanser onto kitchen roll or tissue, and then stroke and swirl your brushes against it, until they are clean. I like to do it in the evening and then leave them to dry over night, so they are ready for me to apply my next face! While there is some staining to my brushes, particularly the blusher brush because I use an extremely bright coral blusher, they are almost practically brand new and feel really really soft. The No 7 Make Up Brush Cleaner is £8.00 from Boots, and I would definitely recommend it to anyone who wears make up regularly. It really is great, I would definitely recommend it! Great review, I would love to try this :) I love your blog and I have followed you with Bloglovin and GFC. If you ever get a chance to check out my blog I would be delighted. Thanks! Thank you! I would definitely recommend it, I haven't tried any other brush cleaners though so there are probably some fantastic alternatives out there on the market.